This is hands-down the BEST sugary sweet Chex Mix Recipe, EVER! 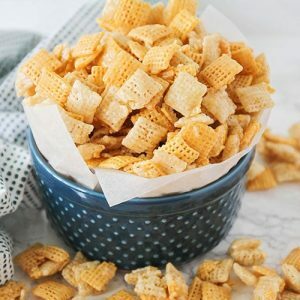 Put the Chex into a large bowl. Set aside. In a deep sauce pan add the syrup, sugar, and butter. Heat it over med high heat, stirring often. When the mixture starts to boil, stir constantly and allow the mixture to boil for 3 minutes. Remove from heat. Pour the syrup over the cereal ad gently combine the cereal and the syrup with a rubber spatula. Stir until the cereal is covered evenly. Dump the mixture into an even layer onto 2-3 cookie sheets. Spray your hands with cooking spray and separate the cereal pieces from each other. Continue turning the cereal over and separating it, every 15 minutes or so for up to 1 hour. Once it has cooled you can eat it, store it or give it away!